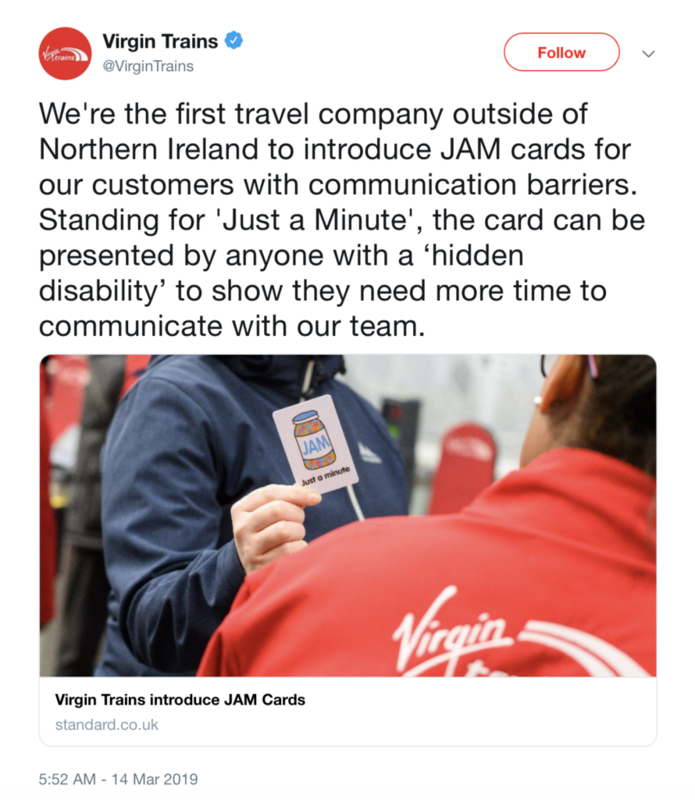 Virgin Trains in the UK, part of Sir Richard Branson’s transportation company, is issuing JAM cards for passengers who need to convey to staff that they need an extra minute to communicate. JAM stands for Just a Minute, and the card can let people know that they’re speaking with someone who has aphasia or another condition and needs extra time to understand and respond. Virgin realizes that train travel can be stressful. They’re aiming to make it more comfortable for people with aphasia. We’re the first travel company outside of Northern Ireland to introduce JAM cards for our customers with communication barriers. Standing for ‘Just a Minute’, the card can be presented by anyone with a ‘hidden disability’ to show they need more time to communicate with our team. Is It Only For Trains? But you don’t have to ride the rails in the UK to get this card. The JAM card is either a physical card (only for people living in the UK) or it can be downloaded on the app created by the NOW group in Northern Ireland. You can download it directly onto your phone right now. While Northern Ireland has done an impressive job training public spaces to recognize the app and card (and providing signage that can be put into windows for businesses that are “JAM friendly”), all of your local businesses can get to know this initiative through your use. Once you download the app, you create an account and sign in. While they currently don’t have “aphasia” listed as an option, you can choose the cause of your aphasia or select “other.” The app is basic, but it’s a great supplement to our physical aphasia card (that you can print out on our site). And if you’re ever traveling in the UK, it’s a great way to discover businesses that are aphasia-friendly.